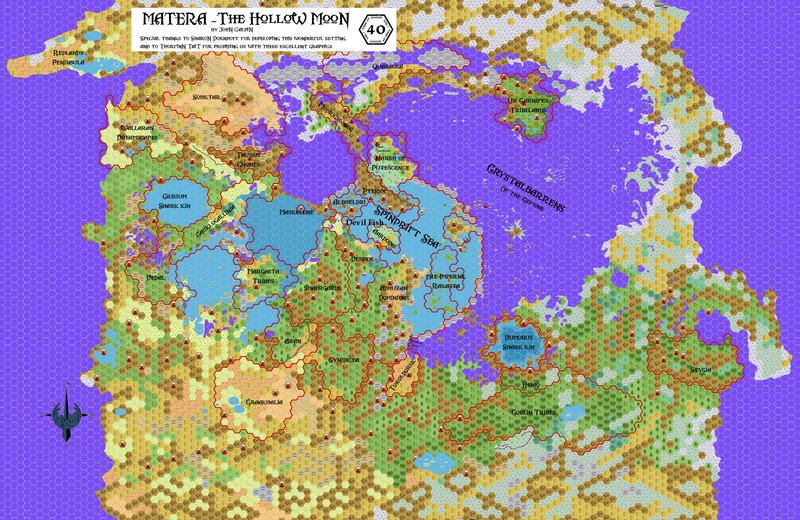 This map of the Hollow Moon covers the Nearside - the inside section of Matera that is always facing Mystara. The base map is a mirror image of our own moon, Luna. The darker blue/violet color represents the crystal firmament of Matera. These are the dark patches on the face of the moon (and on the inside of it as well). It is through the crystal firmament that light from the sun will shine through to illuminate the interior of the Hollow Moon in a dim blue light. Gray hexes represent areas on land that have not been mapped yet. All other hexes should be standard. The map may change as I get a better understanding of the lunar topography as well as of what Sharon's original intentions were. In some cases Sharon has documented her vision of the map in the Hollow Moon material, and in those cases I will try to represent that vision as best as I can. Once that is done I will begin to extrapolate the rest of the map. I am also using RL lunar names for ease of discussion (as Sharon did), but keep in mind that the maps above are a mirror image of the normal lunar landscape. Thus the map should be 170 hexes long, by 85 hexes high. I am working on a copy of the full map, however the map I've posted here is a cropping of the Nearside that shows all pertinent features at this time. The poles are not currently included, nor is the Farside (which is just crystal firmament and so will probably not receive a treatment). 1) There is a feature called the Archerusia Promontory that separates Tranquilitatis from Serenitatis. There are some subsequent references about the location of the Kopru Dominarchy, one of which refers to the Straight Wall (which I assume to be the same as the Archerusia Promonotory) and another which refers to the SWPA range. BM-E wrote: Behind the Straight Wall, a manmade barrier against cryion depredation, the far-more-predatory kopru of the mountains tug discreetly on the strings of their grand puppet empire -- its befuddled, non-kopru inhabitants, hiding their mental subjugation behind a facade of placid civility. Only the constant vigilance of the Deslandren kouprey-ranchers to the west, and the ferocious guerrilla warfare of Shaergarde to the east, has kept this taint of imperialist mind-manipulation from spreading further. BM-AL wrote: In the subterranean hot springs of the Stofler-Walter-Purbach-Arzachel mountain range, giant clams and tubeworms which cluster round the spewing "black smokers" use chemoautotrophic bacteria to live on hydrogen sulphide, and these in turn provide nourishment for the kopru and a bewildering array of intermediate lifeforms... many of them extinct throughout the rest of the world, long before the Hollow Moon or even the dinosaurs ever existed. Slithery giant hagfishes, and relict trilobites unseen beyond the vents since the Cambrian, are among the least-alien of these freakish fossils come to life. These two locations are separated by some distance and it doesn't seem likely that the Dominarchy extends through each. I'm assuming that the reference to the SWPA is correct, but I'm not sure. Copernicus is said here to be on the Midland Ocean's (Spindrift Sea) shore, however previous references state that 1) all of Procellarium within 25deg of 0,0 should be included in the sea (which should encompass Copernicus) and 2) a reference to the Carpathian Archipelago (which would be behind Copernicus in the sea). I'm currently drawing Copernicus as a fairly large island in the Midland Sea, but I'd like to get your input on this. 3) I'd also love to get your input on the Foecunditatis/Tranquillitatis Strait. I actually drew a large portion of the map (mostly the crystlbarrens and seas) before going back and really reading (and understanding) your descriptions. I did this purposely, in order to see how much of my own visions matched with your own. In the case of the Straight, I figured that the naroness of the straight, coupled with the freezing properties of the crystal beneath it, might create an ice fringed passage between the two seas. I see this as being a very dangerous place, with the ice from the crystalbarrens being thawed and cracked constantly by nearby volcanic activity. In this case the straight would be very hazardous to traverse (what with all of the icebergs floating through it). What are your thoughts. 4) Related to #3 above, there are several places (especially near the seas) where there are patches of barren crystal open on the landscape. Again, this stems from drawing the terrain before going into your descriptions in depth. What do you think about these scattered crystal patches? 5) What kind of terrain should be around the Altai Scarp? I'm not sure I'm happy with my current depiction. Should it be more rocky, or should it be more woodsy? If you could provide some input here that would be great. Thanks to: Thorfinn Tait, for providing some wonderful graphics to use in all of our mapping projects, Sharon Dornhoff and Geoff Gander for developing the setting. Also thanks to Havard, Geoff Gander, Andrew Theisen, Hervé Musseau, TraverseTravis for their support during this mapping effort. Last edited by Chimpman on Mon Jan 31, 2011 5:40 am, edited 7 times in total. Wow, that looks really good Chimpman! All of the above seas have been represented as crystal and labeled on the map. In some cases, some of the crystal is covered in water. Sini Aestuum and Medii are located under the Appenines and are also covered in water. Iridum joins Imbrium underneath the Juras, and Roris borders them to the north - no seas cover either. In their current incarnation neither Somni nor Putredinis are crystal or have oceans covering them. BM-LG wrote: Of the moon's ten crystalline-bottomed interior maria, four -- Foecunditatis, Tranquillitatis, Crisium and Humorum -- are saltwater seas; Foecunditatis and Tranquillitatis are connected to one another by a narrow strait, while Crisium and Humorum are bounded by land and have no direct connection to other maria. Another body of water -- known to various native cultures as the "Midland Ocean", "Vesper Ocean", or "Great Spindrift Sea" -- encompasses the Mare Vaporum, Sinus Aestuum, and Sinus Medii ... plus ALL parts of Maria Imbrium, Nubium, and Serenitatis or the Oceanus Procellarum which lie within 25 degrees of the Nearside's midpoint at lunar coordinates (0,0)*. Another 30 miles of ice-flats surround this Midland Ocean wherever it peters out on open crystal, as these regions are periodically flooded by the Hollow Moon's tides, then freeze solid between inundations. The remainder of Maria Imbrium, Nubium and Serenitatis, like the better part of Oceanus Procellarum, are exposed, frigid, desolate crystalbarrens. Mare Nectaris -- true to its name -- is a freshwater lake: the only body of fresh water in the Hollow Moon to sport a crystalline bottom. Mare Frigoris, and the adjacent Sinus Roris, are permanently ice-sheathed. After drawing in the straight that connects Foecunditatis and Tranquillitatis it became apparent that this would be a very dangerous passage to take. The ice sheets will expand and recede with the tides, probably leaving icebergs floating the entire length of the passage. Mentioning that Frigoris and Roris are ice-sheathed implies that they are at least partially covered in water (albeit frozen water). I have drawn glaciers in their centers to represent this. BM-LG wrote: The Hollow Moon is EXTREMELY active geologically, with more live volcanoes per square mile than can be found in any part of Mystara, barring uninhabitable deathtraps like Sind's Burning Waste. In fact, vulcanism is responsible for every mountain, sinkhole, island or caldera within the HM setting! Over time, many of the older or broader volcanic cones -- Deslandres, Ptolemaeus, Fracastorius, Hipparchus, Clavius, Janssen and others* -- have collapsed, forming calderas, lakes, badlands, or plains of rich volcanic soil. Other inland peaks*, such as Arzachel, Langrenus, Aristoteles or the mighty Mt. Copernicus, grew to fantastic heights in the low-pressure airlessness that prevailed within Matera, before the Immortal Ka and his associates thickened and oxygenated its atmosphere. Actual "ranges" of crater-born peaks are all but unknown, in the Hollow Moon, as the basalt-heating impacts which created them tended to occur at widely-separated points in geologic history; the chief exception is the sprawling Stofler-Walter-Purbach-Arzachel Range that overlooks Mare Nubium. This long stretch of rugged semi-active peaks resembles parts of the U.S. Pacific Northwest, and its mountains date back to a series of impacts by a single asteroid that split into pieces just before collision, tracing a line of "hot spots" not unlike the comet that struck Jupiter a few years ago IRL. Other so-called mountain "ranges", such as the Taurus and Caucasus, are actually lone calderas which fragmented into many smaller cones, that later grew independently. They don't form straight lines of peaks, the way mountains tend to be arranged on planets with normal tectonic activity. More detailed maps should show the mountain ranges as series of linked craters. At this scale we can not show that. Each of the mountain ranges should have several volcanoes. BM-LG wrote: While mountains in the "inland" parts of the moon are numerous and densely-packed, volcanoes in the maria are few and far-between. Impacts that hit bare crystal, on the outer moon, didn't have any solid basalt to heat up, on the other side of the Materan bedrock. However, some of them did transfer sufficient residual heat to the moon's arid interior, to fuse encrustations of dust upon the inner surface, creating "islands" of metamorphic rock within the crystalline desolation of various lunar maria. Some of these islands, such as the Fra Mauro or Haemus Isles, are large enough to sustain their own vulcanism, and habitable to all manner of life because of geothermal heat. Others, like the Carpathian or Riphaeus-Ural Archipelagos, are too flat and ground-hugging to retain active magma beneath their surface, offering "oases" of inhabitable land in the midst of the crystalbarrens only for races which -- like the cryions -- are capable of living comfortably in a sub-zero environment. Encrustation-flats in Mare Vaporum and Sinus Medii have long since been inundated by seawater ... and the maeshimer of the Great Spindrift Sea have worked many architectural wonders, with these stretches of fused-dust seabed. Two archipelagos are mentioned, both falling within the Spindrift Sea - the Carpathian and Riphaeus-Urals. The latter may fall slightly outside of the 25 deg range specified for the Spindrift Sea, but because they are mentioned specifically as archipelagos, I extended the boundaries somewhat. Neither archipelago is large enough to be volcanically active. The size and shapes of the Fra Mauro may change. I'm still trying to find good online topographical maps of Luna to help better define these. The properties of the crystal firmament make undersea dwelling unlikely unless there are encrustation flats already present. This appears to be the case in Vaporum and Medii - the only place this is mentioned. Last edited by Chimpman on Thu Apr 09, 2009 4:53 am, edited 9 times in total. I can't wait to get home to view the maps! FWIW, I remember Sharon telling me that she had a sketched map of the HM setting that she was using. I wonder if she still has it? Regardless, someone should let her know this is going on, as I'm sure she'd love to share some insights if she can. I'll PM her. She stops by the boards every once in a while. Humorum is different from all other seas in that its bottom is not exposed crystal. We also have information about the southern shores of the Spindrift - the Rilles are swampland, while the rest of the coast from Medii to Nubium is rocky - can probably use mountains and brokenlands to display this. BM-ST wrote: The second largest body of water, and second deepest, is that which encompasses both Maria Tranquillitatis and Foecunditatis. ... The two seas are joined by a strait that passes between the smouldering volcano Mt. Taruntius and the sandbar-encircled Cape De Vinci* ...a perilous arrangement, and one which is often treacherous for shipping. ... The isthmus which sets them apart from freshwater Mare Nectaris is low and hilly with only a few volcanoes, and the sandy shores of the northeast are gentle; but their other coasts are generally rocky and steep, making safe harbours few and far between. It's becoming apparent that I'm going to need to represent varying ocean depths, as well as varying light levels. I'll use the standard ocean colors to represent depth, but may need to come up with new hex graphics for light levels. Again another reference to depth. Fecunditatis is shallow because of coral growth. This may be another location that is fairly suitable for underwater civilizations. Tranquillitatis is listed as having fewer islands than Fecunditatis, so Fecunditatis must have enough islands that this is noteworthy. Currently there are none on the map. The islands may be small enough that they do not appear at this scale. It is also likely that the islands are coral based and would therefore have no real moon equivalent features that they can be derived from. The Archerusia Promontory should divide Fecunditatis and Serenitatis - the current map needs to be reworked in this general area to account for this. BM-ST wrote: The other eastern sea is Mare Crisium, which is noted for its extreme clarity and shallowness. Its waters are so clear, due to a comparative lack of silicates and other minerals, and its depths so slight -- about 40', which is easily within skin-divers' range -- that the light which shines up from the seabed at fulldark reaches the surface almost undiminished. ... Only a paucity of minerals keeps corals and algae from taking over the depths, under such circumstances ... that, and the careful husbandry of an amphibious nation of shark-kin, who claim Crisium and the surrounding shorelines for their own. Bright, clean, and lagoon-like, Mare Crisium would be the kind of paradise that Mystara's Ierendi islanders would love ... if only those crystal-clear waters (55 degrees F) weren't so darn chilly. A reference to a nation of shark-kin - it seems despite the shallow sea and crystal bottom, the creatures can dwell here comfortably. These shark-kin are mentioned as being amphibious, so they may have actual settlements on the coast. Humorum is the deepest of all the seas in the HM, and also the darkest. Humorum is located in a large mountainous basin. Because the crystal firmament throughout the HM is always at the same level, the neighboring land must be much higher around Humorum than it is around the other seas. Last edited by Chimpman on Thu Apr 30, 2009 4:24 am, edited 3 times in total. Chimpman wrote: I'll PM her. She stops by the boards every once in a while. Yeah- she pops up in the Ravenloft forums now and then; the Domains of Darkness have stolen her from us Mystarans. I've heard from Rotipher. She let me know that she's available if any questions come up, and that she'd love to see the final product. I'd like to get through as much of her posted articles as I can before we start firing questions her way. At this stage it's still too early - I'm finding (and correcting) plenty of inconsistencies between my map and her work the more I go through it. Once I can no longer answer my own questions just by reading her work, I'll send her another PM. I'll try to gather all of those unanswerable questions in the first post. It is awesome that you are continuing this work and maybe getting Sharon involved as well. I am looking forward to seeing how this develops! BM-CW wrote: ...The only sizeable marshlands on Matera -- the Rilles and Palus Putredinis -- are kept boggy by these frequent rains. The subterranean geysers of the Stofler-Walter-Purbach-Arzachel Range, and the steam-plumes on the crowns of the Apennines, also have their aquifers filled by such precipitation. The Rilles and Putredinis are mentioned as the only sizable marshes - I may need to remove the marshland from Somni, or at least make it smaller. The area around these two seas should contain some grasslands (probably the only ones on the HM). The Nectaris isthmus is mentioned again - this time with reference to temperate rain forests. The Sohktar desert is mentioned - one of the few Materan labels for places. This could be the region north of the Taurus and Somnorium extending all the way to Frigoris. I am unsure as to the farward extension of this terrain. the areas around the Alps and Juras should be cold. BM-CW wrote: The same peninsula of land which juts out to Mare Orientale, and encompasses the Rooks and Cordilleras, also shades this region from the light of the lunar "dawn"; this keeps the Stygian landscape extraordinarily gloomy and eerie-looking ... Not until you reach Deslandres off Mare Nubium does the light become bright enough, and the climate, warm enough (60 F) for human farming techniques ... the south pole's "Shadow Zone" is generally between 25 and 30 degrees F, and almost totally devoid of water or vegetation. Mare Orientale is the site of the Great Impact in Matera's ancient history. It is from here that voidships can enter. The crystal firmament should show, but there should be no water seas covering the area. I'm not sure what the peninsula of land is that juts out to Orientale. The Rooks and Cordilleras are mountain ranges that encircle the mare. I have to admit that most of this paragraph throws me for a loop. I'll need to think on this more before doing anything here. It sounds like there might be a southern desert between the SWPA range and Rheita, where it then changes to savannah. Last edited by Chimpman on Sat Apr 11, 2009 8:56 am, edited 5 times in total. I'm following this with great interest - you're taking on an awesome project, John. You'll have to forgive these rather excessive note posts, but they really help me to focus my work efforts. This paragraph actually answers some of my previous questions. Orientale is on Farside (which is all crystal), but the Cordilleras intersect Nearside. This forms a peninsula of mountains onto Farside. I'll need to determine what latitude the demarcation between Nearside and Farside is. Here is another reference to Haemus Islands (plural). BM-E wrote: Past the perils of Stygia, beyond Humorum, the southern outlands' forests teem with goblinoids that relish the eternal night... On the islands of Fra Mauro in the Mare Nubium, the relict culture of Patera's pre-Imperial rakastas fish the crater-lakes ... Behind the Straight Wall, a manmade barrier against cryion depredation, the far-more-predatory kopru of the mountains tug discreetly on the strings of their grand puppet empire -- its befuddled, non-kopru inhabitants, hiding their mental subjugation behind a facade of placid civility. Only the constant vigilance of the Deslandren kouprey-ranchers to the west, and the ferocious guerrilla warfare of Shaergarde to the east, has kept this taint of imperialist mind-manipulation from spreading further. There are more forests in the south, beyond Humorum. Perhaps place these between Humorum and the SWPA range? The last portion of this paragraph I have a quandary about. Does the Straight Wall refer to the wall between Serenitatis and Tranquillitatis? Deslanders however, is near the SWPA, so that doesn't seem to fit. Where is Shaergarde (the land of the hin)? Who and what are the Deslandren kouprey-ranchers? The Vesperlands (shore of Medii) are home to schattenalfen. The Rilles are lupin lands. Tranquillitatis lacks it's own inhabitants - does this mean that the kopru do not dwell there? The citadel (haunted?) of Maskelyne is on an island in Fecunditatis. Mention of the trifold isthmus between the 3 mares - supports current map depiction (although it is more like a large peninsula attached to an isthmus - the third leg does not link up with other land). The north shore of Fecunditatis is montane biome. BM-E wrote: the phanatrels of the Nectaris shores, labour with equal joy for the Altai Scarp's gracious araneas ... indeed, their silken windships are greeted with enthusiasm by the trade-cities of the Cacklogallinians ... Farward of Sohktar, the Redlands' peninsula extends beyond the rim into lands they would not be so accepted in, but that region of poison soils and distorted life is inaccessible by windship: though the Savage Coast's nocturnal races also have their refuge, Ka and his allies will not let the contamination of the Red Curse breach the Nearside's rim. There are probably some wooded areas on the southern shores of Nectaris to support the phanatons there, while the areneas appear to be cliff dwellers on the nearby scarp. It also appears that the araneas have skyships/windships? There is a peninsula that juts out to the farside past the Sohktar desert. This is seeded with the Red Curse. Windships can not reach it. Last edited by Chimpman on Thu Apr 30, 2009 4:29 am, edited 6 times in total. Volcanic flow from Gutenberg to Nectaris could be represented by volcanic terrain. More evidence for smaller islands in the eastern seas. These mountain ranges are listed as collapsed calderas - this may be important when doing more detailed maps. Last edited by Chimpman on Thu Apr 09, 2009 6:18 am, edited 1 time in total. BM-V wrote: Mosses and other primitive plants. ... in the absence of grasses, which can't handle the conditions there, meadows and slopes on the western half of the Nearside became covered with dense carpets of moss, and enormous horsetails sprang up like bamboo-stands in swampy, low-lying regions, taking the place of wetland hardwoods (which also haven't done so well, in the HM). So successful are these plants -- so often overlooked, on Mystara! -- that sphagnum and other peat mosses have turned much of Stygia's lower ground into spongy, acidic peat bogs, by their accumulation and decay. BM-V wrote: Grasses, including grains. ... they didn't do so hot, when introduced to the western half of Matera's Nearside ... Grasses can grow okay in the eastern lands, where dawn's direct light strikes quite early after a fulldark, and a little light from Oceanus Procellarum glints off the Firmament to fall on the Foecunditatis- Tranquillitatis region. On western Nearside, when it might be appropriate to use grasslands/plains/etc..., replace with mossy terrain instead. This I found really interesting and just had to make a not of it. It's possible that we may want to mark any sea hexes that are heavy seaweed forests. BM-V wrote: ... Lunar fungi take an astonishing range of forms. In addition to the usual shelf fungi, puffballs, moulds, stinkhorns, morels, and -- of course! -- mushrooms, there are fungi shaped like cups, crowns, deer-antlers, nets, icky lumps of jelly, birds' nests (with eggs), flowers, miniature trees, trumpets, elephants' ears, horses' tails, elves' ears, and even human faces. ... and are actively cultivated by the vesper elves and Cynidiceans, as well as other cultures who've learned farming techniques from them. There should probably be some areas along the southern shores of Spindrift that have fungal forests. Determining where the Cynidiceans live may yield additional locations for fungal forests. BM-V wrote: So-called "reindeer moss" is actually a lichen, and it's an important source of animal fodder on the Oceanus Procellarum, being one of the few forms of vegetation that will grow on the sand-crust "islands" where cryions keep their herds. Last edited by Chimpman on Mon May 04, 2009 6:12 pm, edited 1 time in total. All other oceans (including the Spindrift) should have sediment rich rivers feeding them. So the kopru are living in (or under) the SWPA range. This answers one question. I'm thinking that the entire above ground area between that range and Nubium should be very similar to Yellowstone Park. Geysers, steam vents, mud pots, etc. It's also interesting to note that this may be one of the few areas on the HM to have something approaching a true underground environment (similar to the Broken Lands of Shadow Elf territories on Mystara). BM-AL wrote: ... The flightless Dark Jungle cassowary -- long extirpated from the Orcs' Head Peninsula, by the humanoid tribes' careless overhunting -- has been given free reign in the midland forests, where few predators dare challenge its formidable claws and legendary temper. A few of these fierce ratites are actually tamed as steeds by the hin of Shaergarde. ... One small glade in the heart of the Wallaran dreamlands, yet cut off even from that mysterious region by steep cliffs or deep chasms on all sides, is home to giant kiwis and the giant earthworms they sniff out. The midlands are between Humorum and Nectaris. We already know that this area is full of mountain ranges (the SWPA being just one of them). There are probably numerous streams and lakes in this region as well, and of course the forests mentioned above. It seems that Shaergarde is located somewhere in the midlands. A reference to an area in the Wallaran dreamlands that is isolated by steep cliffs and/or deep chasms on all sides. This would be a neat place to find. I'm not sure that it will show up on a map of this scale however. There must be some form of forest in these lands as well, lest many of these species (tree dwellers) wouldn't have a home. Here is another reference to the rain forests on the isthmus of Fecunditatis and Tranquillitatis. What does "margasta" mean? Is that some descriptive, or is it a Materan label for the rain forest? This just answers a question I had previously (who and what were the kouprey ranchers). Last edited by Chimpman on Mon May 04, 2009 6:13 pm, edited 3 times in total. The "Jura Peninsula" is a plateau. Borderd to the south by the Juras, north by Sinus Roris, west by cliff, and east by glaciers. The current map (I think) has the last two directions flipped (Sharon refers to HM east and west in the same way that the HW does). Looking at the map I can see that this makes more sense. HMC-UCT wrote: Vegetation on the plateau is a mixture of dense, shoulder-high bracken and cycads, and stands of slim tropical trees and palms; the latter tend to cluster along the banks of this sodden land's hundreds of creeks and rivers. The central portion of the Ur-tribelands is sunken several yards below the plateau's rim, forming a shallow series of long, narrow lakes that teem with fish and crocodilians. There are several different terrains that need to be represented on the plateau. Jungle, bracken and cycads, rivers, lakes. There is an inner depression on the center of the plateau which houses a string of lakes. The depression is only yards deep, so does it need to be drawn on the map? Probably not.I'm assuming that this string follows along the rim of the inner depression. Several of the streams and lakes probably feed into these (as mini-waterfalls falling over the crest of the inner depression). HMC-PotA wrote: Less a "range" of individual mountains, than a continuous ridge of upthrust rock between Mare Imbrium and the Great Spindrift Sea. Though not exceptionally steep or geologically destructive -- the lava-wells which dot the southeastern side of the ridge seep molten magma only gradually ... On the northwestern face, overlooking Mare Imbrium's crystalbarrens, the Apennines appear stark, lifeless and featureless, save where the vast, crevice-riddled cliff which serves as their foothills abuts the stagnant Marsh of Putrescence. This suggests a sharp ridge along the Marshes of putrescence and the crustalbarrens side, and a gradual slope done to the seaward side. It may also make sense to have rivers of lava flowing steadily through this land. The Pteryx having been able to direct its flow steadily toward the sea. They may also be able to use the lave flows as a sort of power source (for heating their lands for example). This land may also have just as much terrain underground as it does above since many of the Pteryx cities are hanging from the ceilings of caverns. Another reference to suggest controlled lava rivers. These may be represented more like canals than rivers, since many would be artificial creations of the Pteryx themselves. Stretches of these lava rivers would be straight and possibly have magically treated banks to prevent buildup. It is probably that none of these lakes may be visible at this scale. HMC-PotA wrote: In keeping with the name of the original city Ka had sent to the Hollow Moon, Attyx*, the suspended cities bear troggish use-names such as Perryx, Myttex, Corryx, Veddyx, and Nyzzax. HMC-PotA wrote: Ka the Preserver plucked Attyx's rock-pillar from the sea and bore it to the Hollow Moon in its entirety, along with several hundred pteryx warriors and residents ... plus thousands of troglodytes who'd been working there as fishing-crews, labourers or marines. ... For the first couple of generations after their arrival, the HM pteryx explored the boundaries of their new world, recovered as much of their magical lore and technology as possible from Attyx's ruins, and gradually built up their own numbers. Where are the ruins of Attyx located? It sounds like Ka may not have placed the pteryx directly in the Appenines (they had to search for it), so the ruins of Attyx could be anywhere in the HM. Last edited by Chimpman on Mon May 04, 2009 6:15 pm, edited 2 times in total. HMC-TMoP wrote: After landing at the ramshackle docks of a coastal troglodyte fishing-village, goods are ferried/portaged inland across the tidal saltmarshes of the Marsh's southern corner. ... Much of the coastal landscape consists of muddy gullies and beds of coarse salt-grass, while tangled clusters of stunted mangroves encircle the more permanent, seawater-filled sinkholes and lagoons, reaching their many-branched runners far out into the saltwater. The southern Marsh is saltmarsh which can be represented by the swamp/marsh hex (the one currently being used). Chimpman wrote: Where are the ruins of Attyx located? It sounds like Ka may not have placed the pteryx directly in the Appenines (they had to search for it), so the ruins of Attyx could be anywhere in the HM. I would probably put the pillar somewhere near the Apennines, perhaps in the Sea of Vaporum - perhaps even in one of the Apennine fjords on that side. Logically, it should only be visible on an 8-mile hex map. It's nice to see my little corner of the HM get mapped out. Very cool! Seer of Yhog wrote: I would probably put the pillar somewhere near the Apennines, perhaps in the Sea of Vaporum - perhaps even in one of the Apennine fjords on that side. Logically, it should only be visible on an 8-mile hex map. I like the idea of the Sea of Vaporum. This section actually has so much (geographical) information I was thinking that it would be fairly easy to knock out an 8mi hex map as well. That will have to wait for a little while though... At least until I get through all the rest of my notes on the 40 mi hex map. Thank you so much for this map John!! !